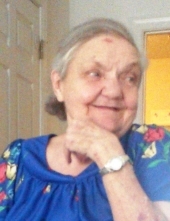 Jessie Lane King, 82, of Stanley passed away April 14, 2019 at Stanley Total Living Center. She was the daughter of the late Lee Monroe Anderson and Ila Lindsay Anderson and wife to the late Walter C. King. Jessie enjoyed reading her bible and going to church. She was a loving mother and grandmother. She loved her fur baby, Foxy. Jessie is survived by sons, Keith Lane and his wife, Barbara; Kevin Lane and wife, Terry; daughters, Angela Lane and Tina Lane; six grandchildren and eight great-grandchildren. In addition to her parents and husband, she was preceded in death by sisters, Betsy Williamson and Ressie Pope. The family will receive friends from 2:00 - 3:00 pm, Wednesday, April 17, 2019 at McLean Funeral Directors of Belmont. A funeral service will be held at 3:00 pm, Wednesday, April 17, 2019 in the Bumgardner Chapel. Condolence messages may be sent online at mcleanfuneral.com. McLean Funeral Directors of Belmont is serving the Lane family. To send flowers or a remembrance gift to the family of Jessie Lane King, please visit our Tribute Store. "Email Address" would like to share the life celebration of Jessie Lane King. Click on the "link" to go to share a favorite memory or leave a condolence message for the family.